Powder Coat Finishing is three times thicker than paint, ensuring your furniture will shrug off sun and storm, season after season. By far the youngest of surface finishing techniques, Powder Coating is an advanced method of applying a decorative and protective finish to a wide range of materials and products. Color and texture selections are limitless, ranging from smooth surfaces with high-gloss to wrinkled and matte finishes. The color choices are virtually unlimited, including clear coats. What makes Powder Coating Finishes "Green"? Unlike liquid paint finishes containing solvents and pollutants known as volatile organic compounds (VOCs), Powder Coat finishes contain no solvents and release only a negligible amount, if any VOCs into the atmosphere. 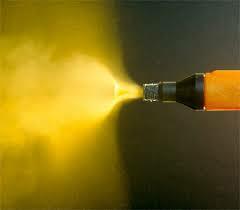 Additionally most Powder Coating overspray does not adhere to the part or the paint equipment, so it can be retrieved and reused virtually eliminating the waste commonly found in liquid finishing. How is Powder Coat Finish Applied? Before a Powder Coat finish is applied it is essential the piece is prepared properly by removing any oil, soil, greases, etc. This is done with a variety of methods including chemical washes or sand-blasting, which usually takes multiple steps to clean completely. Finely ground particles of pigment and resin are then electro-statically charged and sprayed using compressed air onto the products to be coated. The parts to be coated are then electro-statically grounded, so the particles adhere to them. The piece is then heated in a curing oven where the particles fuse into a uniform smooth coating. 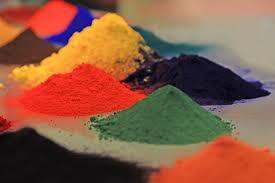 Why is Powder Coating better than Conventional Painting? One of the most economical, longest-lasting and durable finishes available, Powder Coated surfaces are more resistant to chipping, scratching, heat, stains, UV damage and wear than other finishes. The colors also stay bright and vibrant longer. The powder coat finish, once complete, is much thicker and more even than conventional liquid coatings without running or sagging. Who uses Powder Coat Finishing? Powder Coat finishing is the fastest-growing finishing technology in North America and is mainly used for coating metals including aluminum furniture, appliances, automotive parts, sporting goods and countless other products. What is the Best way to Clean Furniture with a Powder Coat Finish? Most stains on aluminum patio furniture can be removed with mild soap or detergent. You should avoid using abrasive cleaners so not to damage the finish. For non-textured, smooth gloss finishes only, you can periodically wax the furniture frame with automotive paste wax to help restore the luster of your finish. However texture finishes should be cleaned with mild soap and water only.